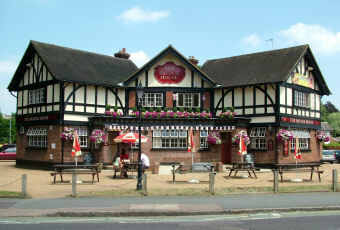 The pub is closed but the car park remains open for commuters. Expect a block of flats or similar on this location before the year is out. Four of us stopped after a 7 mile amble from Watton at Stone (via the Woodman at Chapmore End, where the Ossett Brewery Big Red was a wonderfully tasty beer) yesterday about dusk, as the rain started. The welcome at the bar was quite friendly, and warm. Three and a half of pints of AK in good condition were appreciated. None of us were as keen on the County bitter, so switched back to the AK before the train home. The main bar was closed during my visit at 22:45, but the sports bar that houses a pool table and dartboard was open. I waited at the bar for a minute or so for some service before turning to the old soak sitting at the bar and asking if it was still open. He pointed to a clock that was chalked onto the wall that read 00:15 and said that it was always open. Thankfully the manager turned up to save me from the madness and I grabbed a nice pint of Guinness and sat outside whilst I waited for my train. Whilst waiting I spotted the ubiquitous Hertford AK and Country so assumed that the rest of the selection in the main bar is standard draught. This is a big Mcmullen pub opposite the station and the public bar smells of ketchup. When I revisit Hertford to properly check out the White Swan I will make sure I venture into this place again before shutdown. 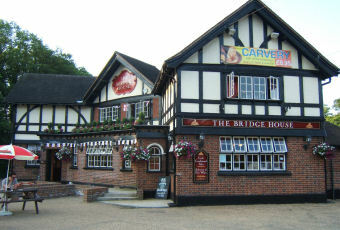 Paid a timely call at this pub with two friends at the beginning of a Hertford crawl on 19th Aug '09. 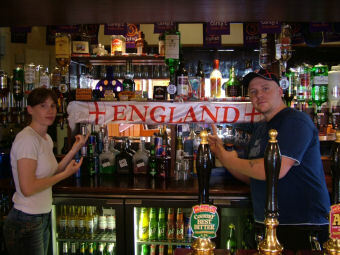 We arrived at around 1930 and found the pub much as I'd left it in 2006 - an encouraging sign. The interior drinking areas were a little quieter than I remember, but it was a warm night and everyone was drinking outside. McMullen's AK was on great form, and went down without touching the sides. Evening food was temporarily unavailable - check with pub for future availability. Absolutely dreadful, needs a thorough good clean.